Conservative justices protest businesses having to sell Plan B. Entry 23: One last snarling, tetchy dissent. U.S. Supreme Court Justice Samuel Alito wrote the dissent to Stormans v. Wiesman. 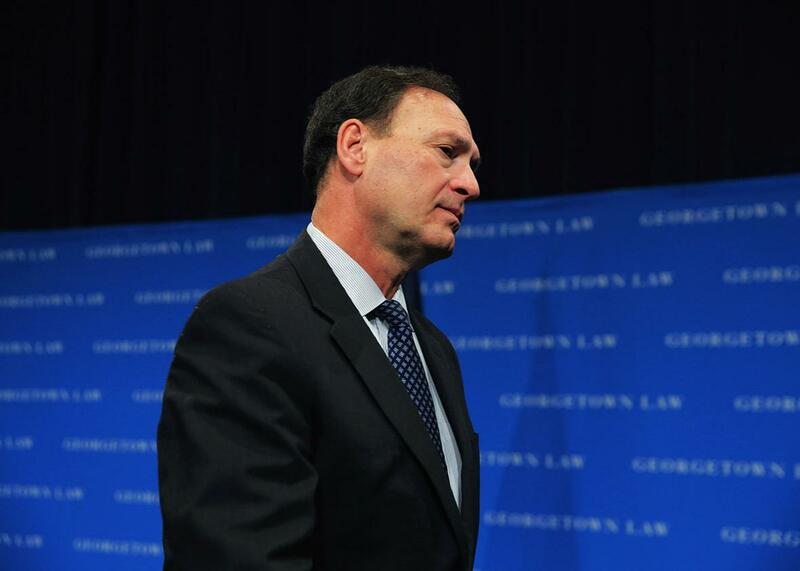 Above, Alito on Feb. 23 in Washington, D.C. The Supreme Court may have handed down its final decisions on Monday—but Tuesday morning gave us one last treat of the term: A snarling and tetchy dissent from three conservative justices who apparently think pharmacies have a constitutional right to refuse to give women Plan B when doing so would violate pharmacists’ religious beliefs. In an opinion by Justice Samuel Alito, joined by Justice Clarence Thomas and (alarmingly) Chief Justice John Roberts, the conservative wing scolded the rest of the court for refusing to hear a challenge to Washington’s pharmacy regulations. These regulations simply forbid religious pharmacies from refusing service on the basis of religion. (Individual pharmacists can refuse to dispense medication on religious grounds, so long as another employee is present and willing to fill in. )* Alito and his colleagues suggest that the Washington rule violates pharmacies’ constitutional religious liberty. In other words, Alito, Thomas, and Roberts seem to believe that, under the Free Exercise Clause of the First Amendment, states are proscribed from requiring for-profit religious businesses to treat all customers equally. If this unholy trinity ever managed to rewrite the First Amendment this way, they could effectively bar states from protecting women, gays, and other minorities from religious-based discrimination. The case that drove the conservatives mad, Stormans v. Wiesman, should not even be controversial. Ralph’s Thriftway is a grocery store and pharmacy in Washington run by a religious family. It is not a church, or a church-affiliated nonprofit; it is a for-profit business, created and designed to make money for the Stormans. But the Stormans family are devout Christians who believe that Plan B is “tantamount to abortion” and thus refuse to stock it. For years, when customers came to the pharmacy seeking emergency contraception, the Stormans turned them away. But in 2007, the Washington State Board of Pharmacy issued new regulations declaring that a pharmacy may not “refuse to deliver a drug or device to a patient because its owner objects to delivery on religious, moral, or other personal grounds.” Quite reasonably, the board felt Washington pharmacies should not be permitted to deny patients safe, legal drugs—which was a growing problem within the state: In addition to Plan B, religious pharmacists had refused to give patients diabetic syringes, insulin, HIV-related medications, and Valium. That, the board decided, was unacceptable. Pharmacists have every right to believe whatever they wish, but when those beliefs are manifested in the form of brazen discrimination against customers, they cannot be sanctioned by the law. In 2015, the 9th U.S. Circuit Court of Appeals affirmed the constitutionality of Washington’s regulation. This cavalier dismissal of women’s interest in nondiscrimination flies in the face of precedent. The court used to say that when a religious accommodation burdens other people’s rights, the accommodation itself violates the separation of church and state. Now Alito wants to push that rule through the looking glass, arguing that there’s a possibility states must give religious employers the right to burden others—a burden that will fall disproportionately on women and gays. But this part of Alito’s dissent is actually the less troubling portion. What comes next is much worse. Alito concedes that, under the Supreme Court’s modern jurisprudence, a law that has the effect of restricting religious exercise doesn’t violate the First Amendment if it is “neutral” and “of general applicability.” Washington’s regulation is undoubtedly neutral and generally applicable—it singles out no religious beliefs for disfavored treatment and applies to every pharmacy in the state. So what’s the problem? Alito cites Church of Lukumi Babalu Aye v. Hialeah, a religious freedom case that carved out an exception to the regular rule. In Church of Lukumi, the city of Hialeah adopted a ban on animal sacrifice that obviously targeted Santeria rituals. The Supreme Court struck it down, holding that seemingly neutral laws that are actually motivated by hostility toward religion violate the Free Exercise Clause. Alito analogizes Church of Lukumi to Stormans, asserting that the real purpose of Washington’s pharmacy regulations was to oppress Christian pharmacists who wish to exercise their faith by denying Plan B to patients. That is not just legally and factually wrong. It is also insulting, devious, dishonest, and dangerous. There is not actually any evidence at all that the pharmacy board singled out Christian pharmacists then punished them for their beliefs. Alito’s efforts to draw a parallel between Church of Lukumi and Stormans are thus wildly inappropriate. In Church of Lukumi, the city of Hialeah passed a law out of pure religious animus that was slyly written to target Santeria rituals and nobody else. In Stormans, Washington adopted a regulation passed out of a sincere interest in preventing discrimination that affected every single pharmacy. It is also dangerous, because it endorses a First Amendment theory that any law designed to prevent religious employers from discriminating against customers on religious grounds inherently violates the Free Exercise Clause. That doctrine would undermine huge chunks of nondiscrimination law and more or less repeal LGBTQ nondiscrimination measures across the country. I’m not surprised Alito and Thomas support this radical belief. But I am startled that Roberts signed onto their paranoid remonstrance against perceived Christian persecution. It is now quite clear that the court’s three religious extremists are eager to erode women and minorities’ rights in the name of religious liberty. And they are two votes away from making their reactionary views the law of the land. And with that—I wish you all a happy summer! Don’t mind the dark clouds on the horizon; perhaps the feeble opposition to women’s rights will have collapsed under the weight of its own sophistry before we meet again. Read the previous entry. | Read the next entry. *Update, June 28, 2016: This article has been updated to note the fact that individual pharmacists may still refuse to dispense medications on religious grounds, so long as a co-worker can immediately fill in.